After the first excitement about the new notebook series of the Danish notebook producer Zepto at the beginning of last summer, Zepto disappeared from the news. However, it seems as if Zepto is now ready to actually deliver the new multimedia all-rounders with outstanding design to customers. 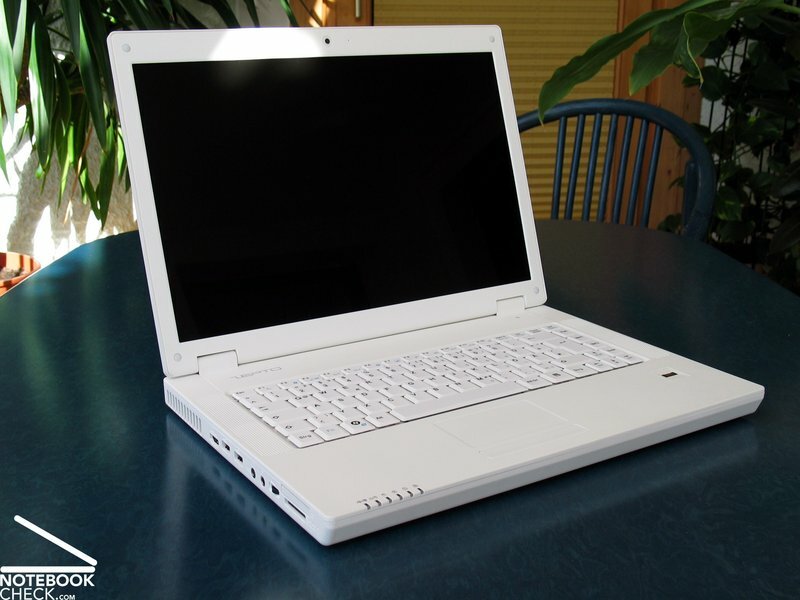 They are called Mythos A15 and Nox A15 and are the powerful middle class of Zepto's 15.4" multimedia notebooks. Despite having different names, they are distinguishable only by their colour: The Mythos is white and the Nox is black. There will be also a 14“ version of both notebooks, but currently only the Nox A14 is available. It is remarkable that the smaller case contains the same powerful hardware as the larger 15” notebook. However, it is not clear yet how well the 14” notebook can manage fan noise and surface temperature. 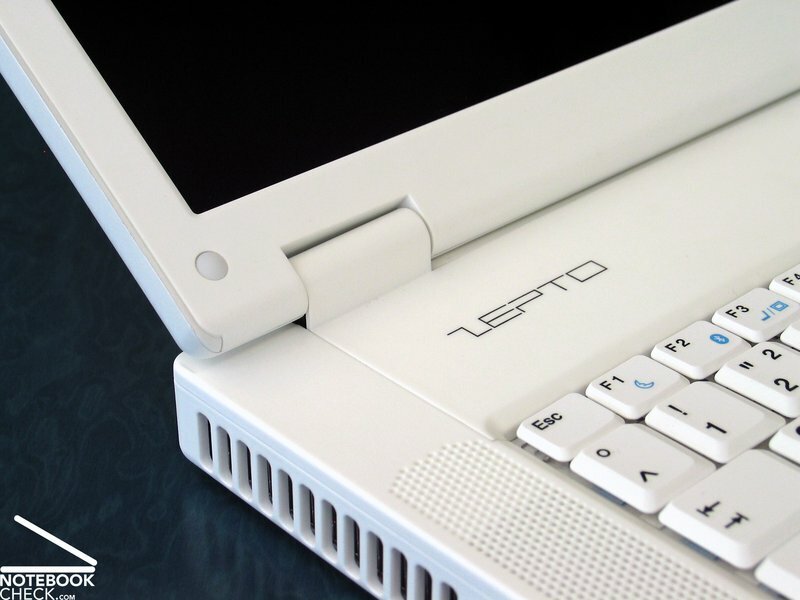 The name „Zepto Mythos A15 – Design“ defines the direction Zepto went with their new barebone. The Mythos is made to attract design conscious customers, who put a lot of weight on looks when making a buying decision. In terms of design, there doesn’t seem to be a way around the popular Apple style at the moment, which the Mythos A15 tries to imitate. 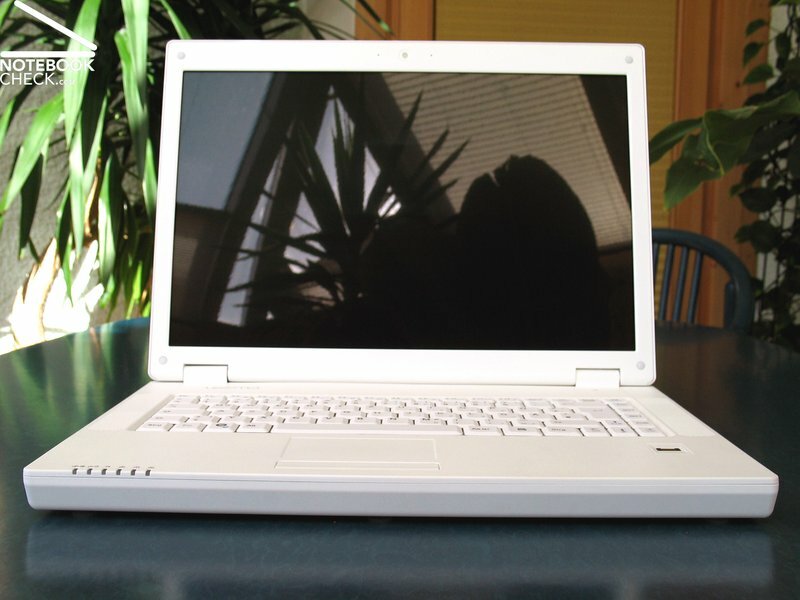 Like the slightly outdated Macbooks (current: Macbook Aluminium), the Mythos A15 is completely white. Therefore it clearly stands out from other notebooks. But apparently Zepto wanted to offer not only eye-candy, but also something for the sense of touch, because the case is completely covered with a rubber surface. Our opinions about the rubber surface are split between those who like the soft feel, and those who think the finish makes it feel “fatty”. The fingerprint repelling components on the other hand, were appreciated by everybody, especially compared with the currently often used glossy-finish. 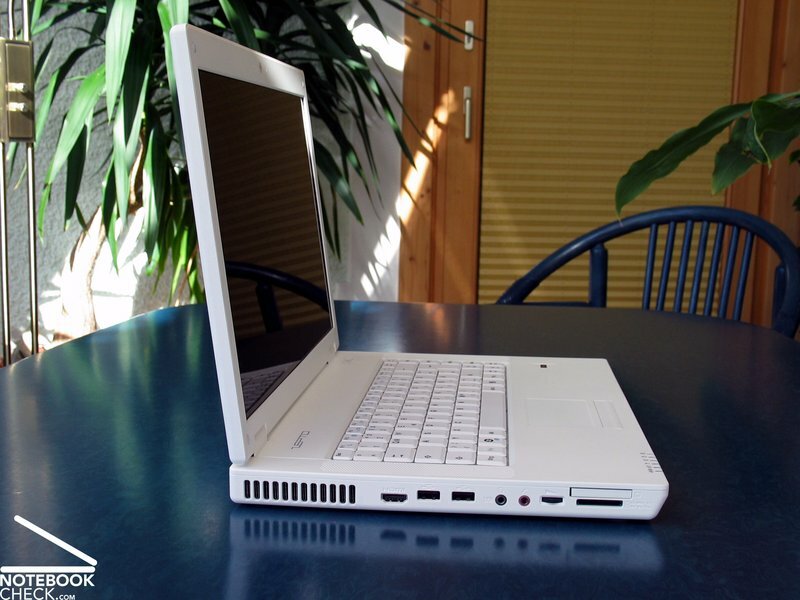 Dust particles are also virtually invisible on the white surface. But it is not clear yet how well the surface will do in long term tests, since there is no practical experience regarding wear and tear, as well as sensitivity to dirt. 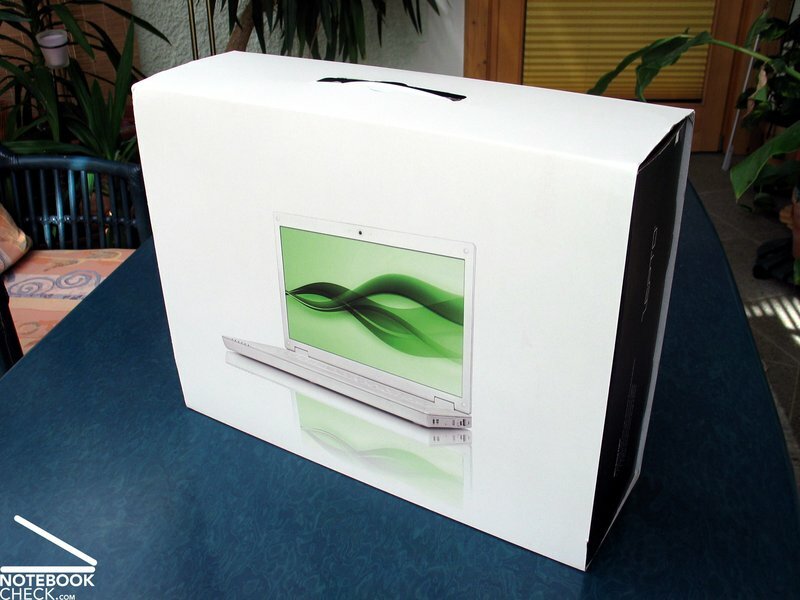 The case was kept simple and geometrical on purpose, which can also be interpreted as following Apple Macbooks style. It feels very much “plastic-like” because of the rubber surface. A glance inside the case doesn’t change this impression. Although it is very flexural rigid and pressure resistant, it is mainly made out of plastic. The aluminum reinforcements were hardly noticeable, apart from some dust particles on the surface of the material. However, there were no creaky noises when the case was handled. The main problem of the case regarding workmanship is the unequally wide clearance around the display, the part above the keyboard, and the 9-cell battery. Additionally, the swich to release the battery was extremely hard to move, which also lowered the overall impression a bit. The display is held in place by typical hinges, which unfortunately can’t quite prevent the 15.4“ panel from wobbling. Furthermore, there is no transport hook to keep the display lid shut. Fortunately, the display lies neatly on the base unit, so that small things cannot easily enter between display and case. Not really impressive on the other hand, was the stability of the display lid. Even modest point pressure caused significant changes of the displayed image. 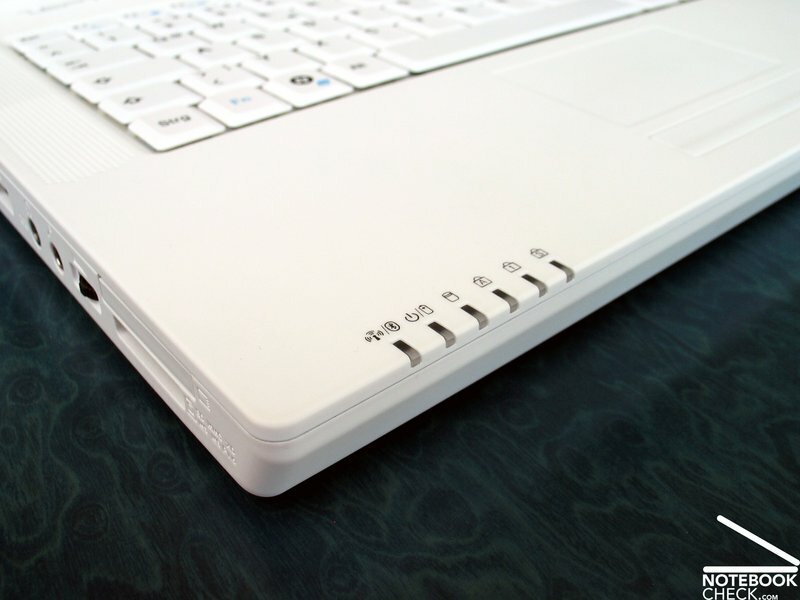 The Zepto Mythos A15 has a range of standard ports on the sides of the case. The back and front stay free of ports, with the exception of a Kensington Lock on the backside. Located on the right side near the front of the notebook is the optical drive, a Blu-Ray drive in our test sample. 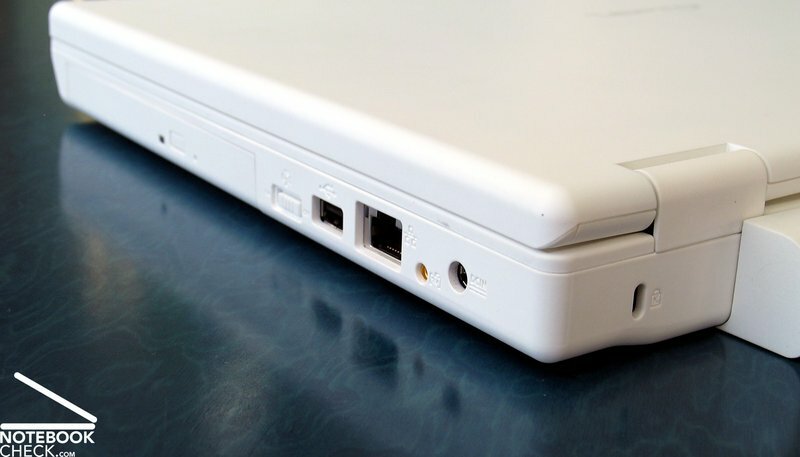 Next to it there is a hardware switch to deactivate the wireless LAN module, an USB 2.0 port, and a LAN connection. 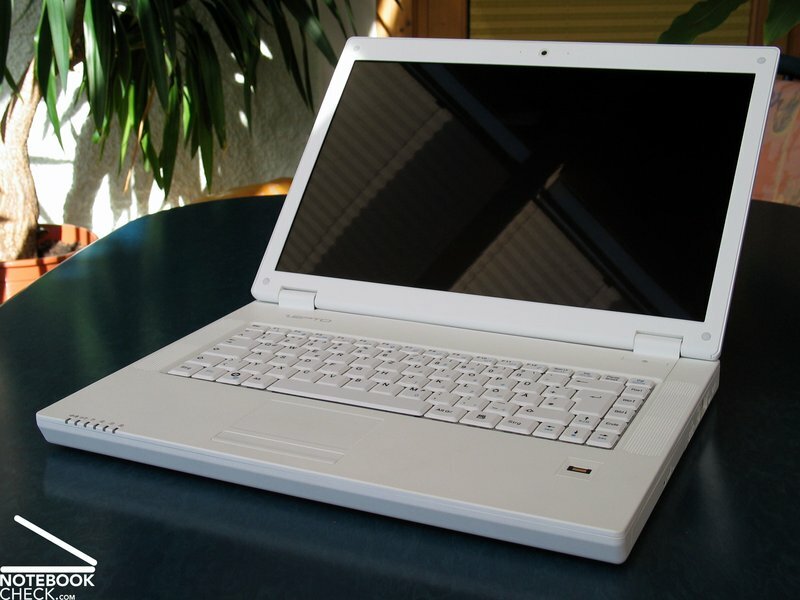 Further to the back is a connection for an antenna signal, if a TV-tuner is built-in the notebook, and the power supply. 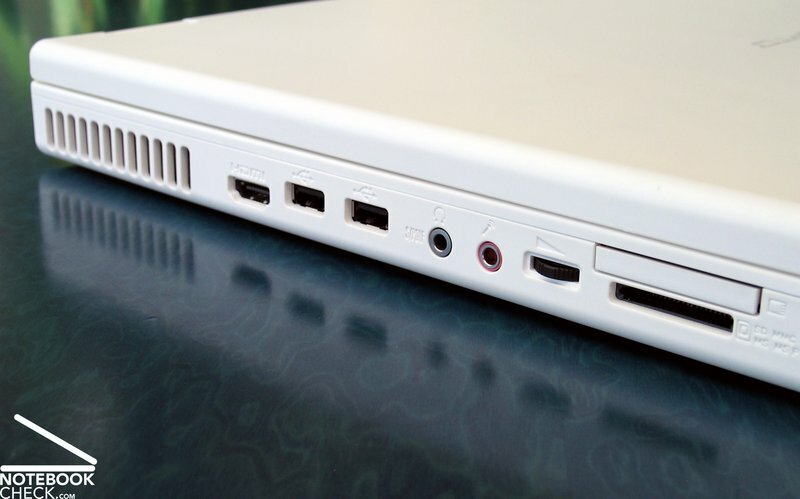 The ports on the left side are mostly located in the middle and near the front, due to the fan at the back. There is an HDMI port, two more USB 2.0 ports, jacks for earphone and microphone and an optical S/PDIF sound output, as well as a digital volume control. Toward the front of the left side are an ExpressCard 34mm slot and a SD-Cardreader. 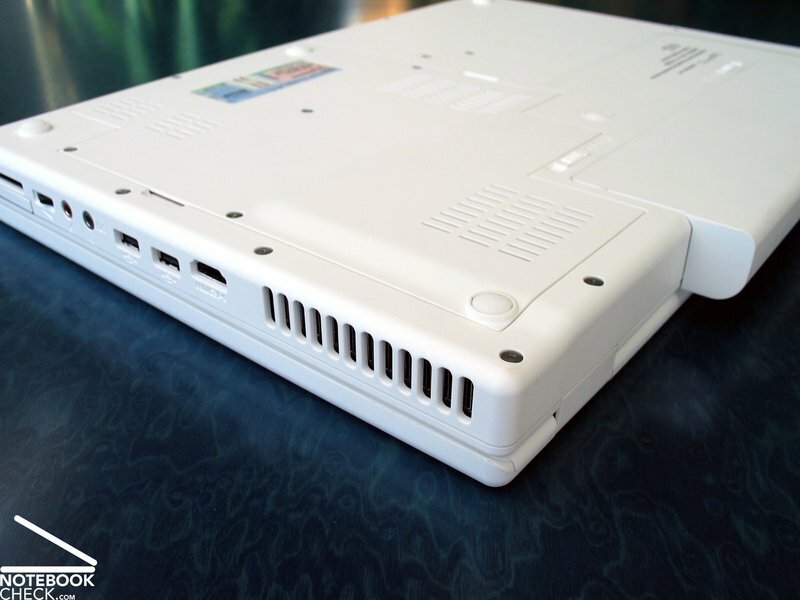 The alignment of the ports on the sides made a positive impression during the test. But admittedly right-handed people get the better deal with the Zepto Mythos A15, since the connections on the right side are located further back. The Zepto Mythos A15 uses a Gigabit Ethernet interface made by Realtek (RTL8168C(P)/8111C(P)) and an in house Zpro N-Standard (b/g/n) wireless LAN module. But gaming over WLAN was difficult on our test sample, due to frequent lags and short interruptions despite short distances from the router. Only the direct connection over cable solved the problem. Since Zepto also offers a WLAN device from Intel, the well known and reliable 4965AGN module, one should seriously consider paying 10 Euro more. There was no docking interface built-in our test sample, but Zepto’s website announced that every Mythos notebook built after December 2008 will have one. This allows extending the Mythos with various additional ports, or to quickly get rid of connected devices. 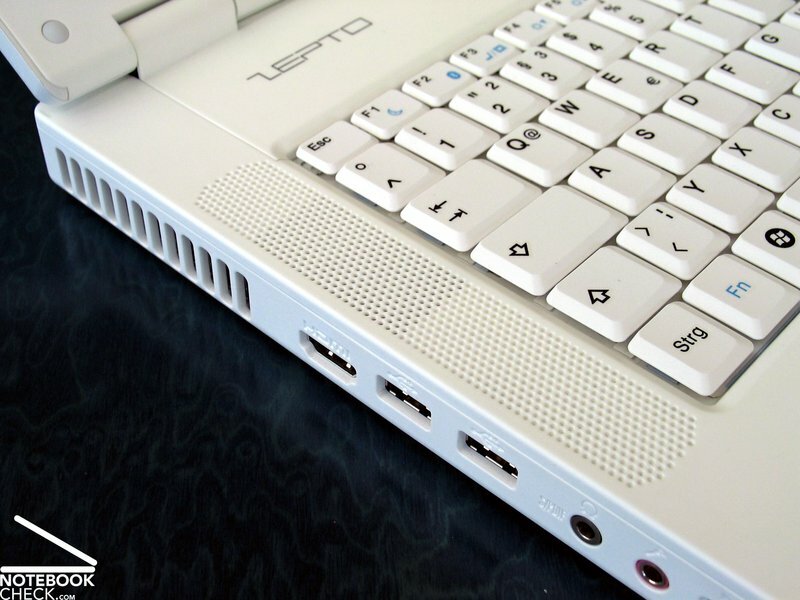 According to Zepto, it will be possible to extend the Mythos with 6 USB and a firewire port. The Mythos usually comes with Windows Vista as operation system. 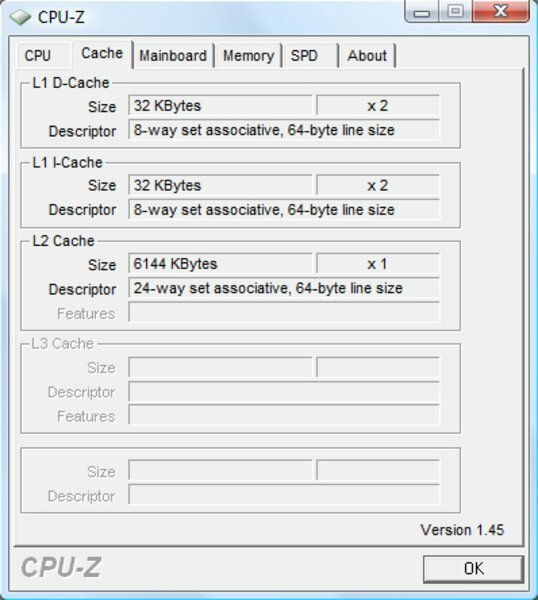 Available are all common 32 and 64 bit versions. The 64 bit version is especially interesting if the notebook contains more than 3GB RAM, and if all applications that will be used with the notebook are compatible. It is also mentioned that the notebook is Linux Ubuntu compatible, which might be interesting for people who like to experiment, or who don’t want a Microsoft operation system. Although there is no official software support, it should be possible to run Linux on the Mythos A15 with alternative drivers. The standard warranty includes only 12 month pick up & return service. Alternatively, there is also a two year QuickREP warranty available, which promises “priority handling” of the notebook repair. But unfortunately there are no precise statements about repair and service durations. 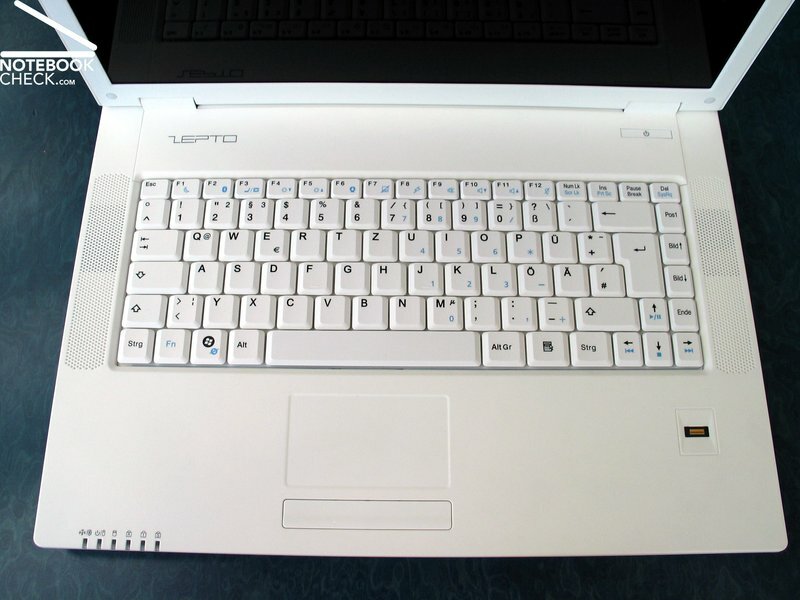 Like the case of the Zepto Mythos A15, the keyboard is entirely white. The contrast to the black and white writing on the keys is very attractive. 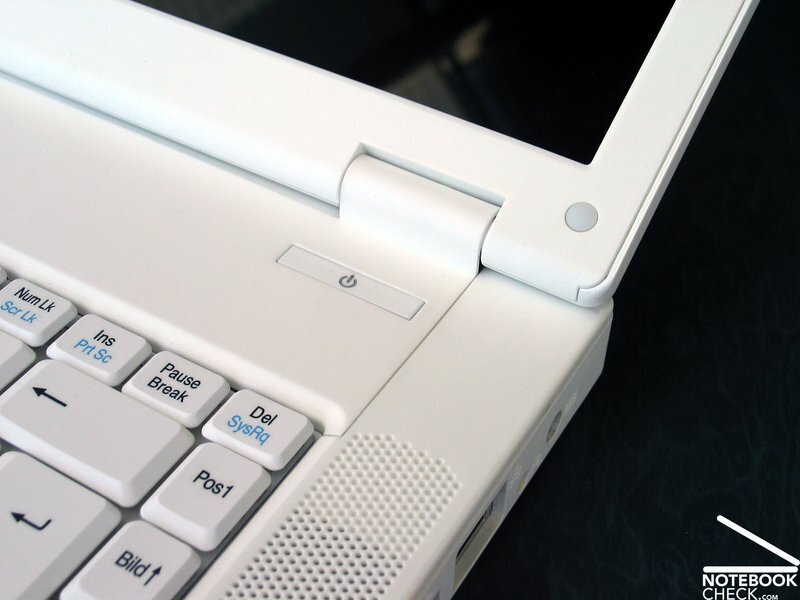 All keys are fitted into the rectangle shaped keyboard unit, which caused space problems around the cursor keys. They and the function keys on the right side of the enter key were reduced in size. 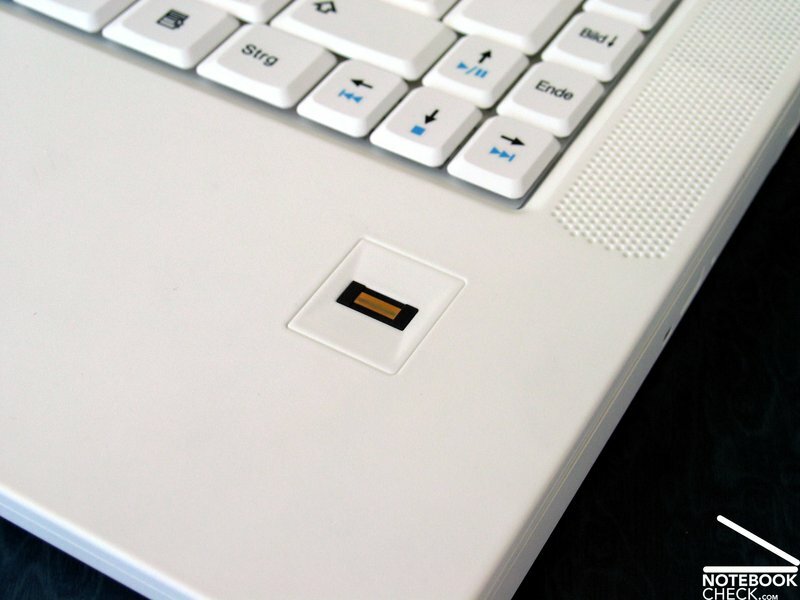 But the rest of the keyboard offers well usable keys with a size of 13x13 millimeter. The keyboard uses a common key layout and all desired function and number keys could be pressed correctly on the first try in the test. Subjective typing feeling was very good, at least on the central keyboard unit. But the keyboard unit in our test sample wasn’t mounted neatly into the case around the A-W-S-D keys, which are especially important for games and thus chattered loudly. An interesting feature of the keyboard is the possibility to deactivate the Windows key (FN+Windows) to prevent accidental pressing and a return to the Windows surface, which can be very annoying while playing games. The sound volume can either be changed with the FN key combination, or with the digital volume control on the left side of the case. 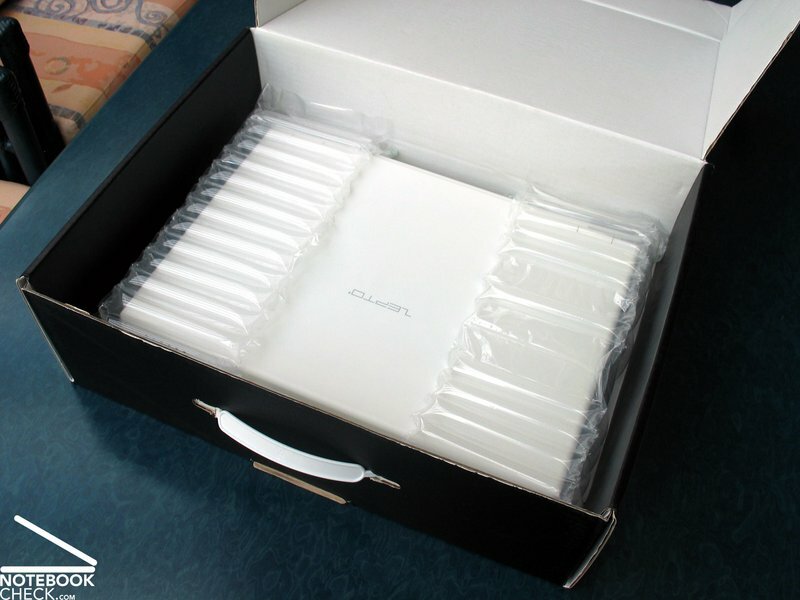 The touchpad is covered with the same rubber surface as the rest of the Mythos A15 case. Therefore it only glides well with very dry fingertips. 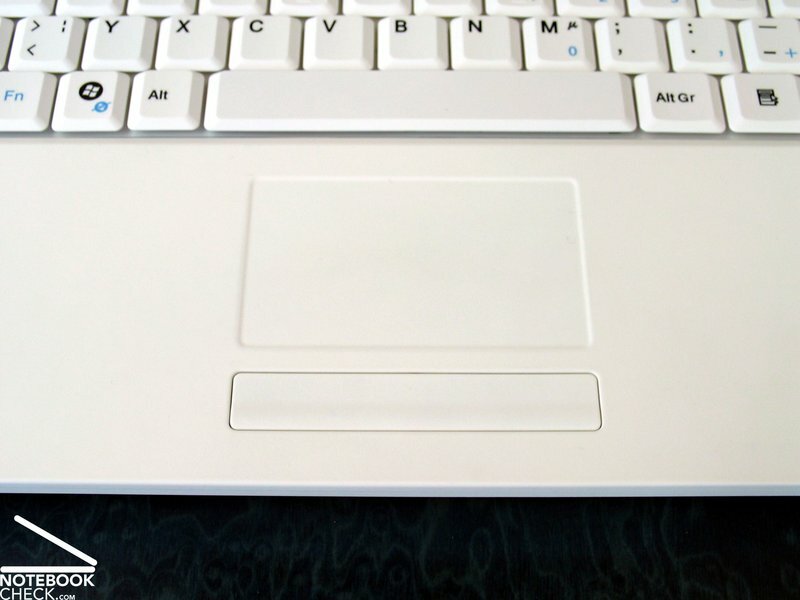 Although the rubber covered touchpad is certainly attractive to look at, it doesn’t seem to be very user friendly. 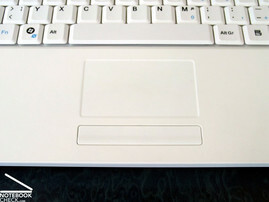 The single, long button below the touchpad suffers from the same problem: It looks good, but only the left and right ends can be pressed properly, the middle part is unusable. Currently there are two different displays available for the Zepto Mythos A15. A common 1280x800 WXGA panel or a high resolution WSXGA display with 1680x1050 pixels. Both displays have a glossy surface. The WSXGA panel offers a much larger working space on the desktop and is thus preferable, even though it costs, depending on configuration, 80 to 130 Euro more than the WXGA display. Our test sample of the Zepto Mythos A15 also had the WSXGA display. It achieved a good maximal brightness of 216cd/m² and a satisfactory average brightness of 197.8cd/m². The illumination of 82.5% was acceptable as well, but especially with very dark or black images some illumination problems were noticeable. The display has an excellent contrast. With a low black value of 0.41cd/m² it managed a maximal contrast of up to 572:1. But the colour display test with the Spyder 3 display calibration tool made by Datacolor indicated a strong blue tint and a very cold image. Due to the glossy display surface of both available displays, the Zepto Mythos isn’t really outdoor capable. The heavy reflection on the display during outdoor usage makes it almost impossible to work on the notebook. Even the good brightness of the display is not enough to compensate for this problem. Viewing angle stability is not exactly a strong aspect of the display either. Even a modest vertical deviation from the optimal viewing angle causes changes of the image. The picture is much more stable in horizontal direction, which is of not much use, since the display reflections get worse with flatter viewing angles. A strong point of the Mythos A15 is certainly its performance, which can be remarkable with the right configuration. The processor choice is limited to Intel processors, starting from a low end P7350 CPU, up to a P9500 CPU with 2.53GHz and 6MB L2-cache. 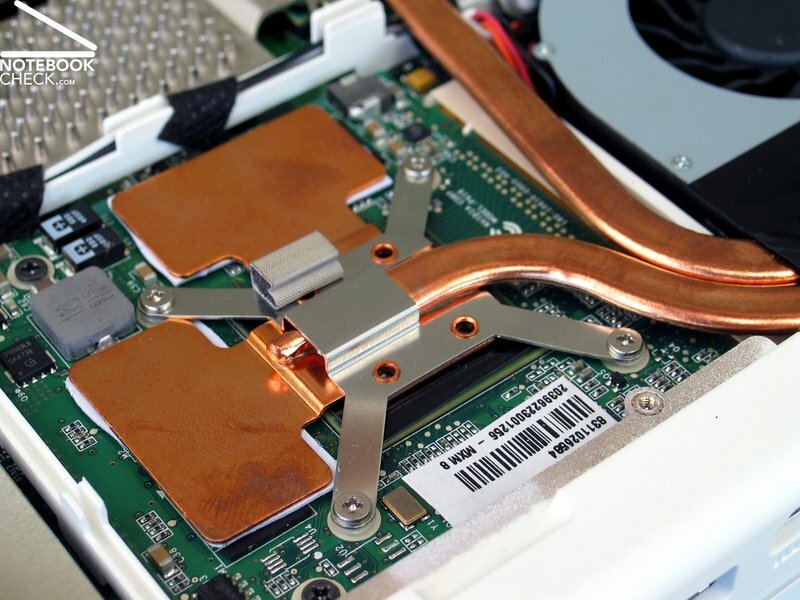 High end Intel processors like the T9400 and T9600 with 2.53 and 2.8GHz are unavailable, supposedly because of their high TDP (thermal design power) value of 35W. 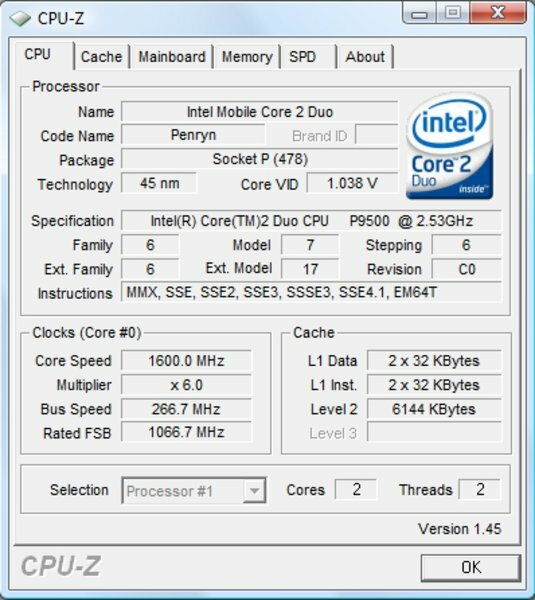 Have a look at our guide for a performance comparison of the various Intel Centrino 2 processors. The Mythos A15 also offers a choice regarding graphics performance. 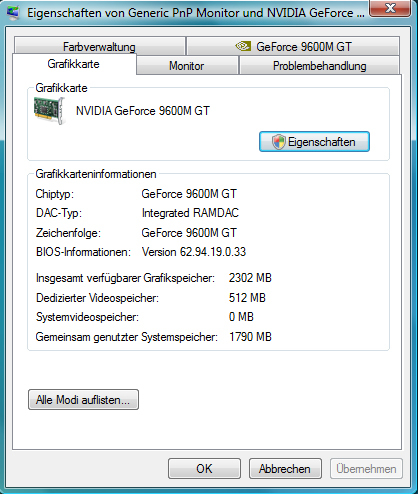 Either the nVIDIA Geforce 9600M GT graphics card, or the slightly faster Geforce 9650M GT graphics card. The 9600M GT graphics card is the successor of the Geforce 8600M GT graphics card. The main difference is the die size reduction to 65nm (8600M GT had 80nm). This made it possible to increase the clock rate, while keeping energy consumption and heat at similar levels. The Geforce 9650M GT graphics card has an even smaller die size of only 55nm. Therefore it was possible to make it faster than the 9600M GT, without increasing energy consumption or heat. This technological advance supposedly made the 9650M GT chips about 20% faster than the 9600M GT chips. Both graphics cards have 512MB GDDR3 video memory. The 3D Mark 2006 benchmark test clearly shows the faster performance of the 9600M GT graphics card compared with the 8600M GT. 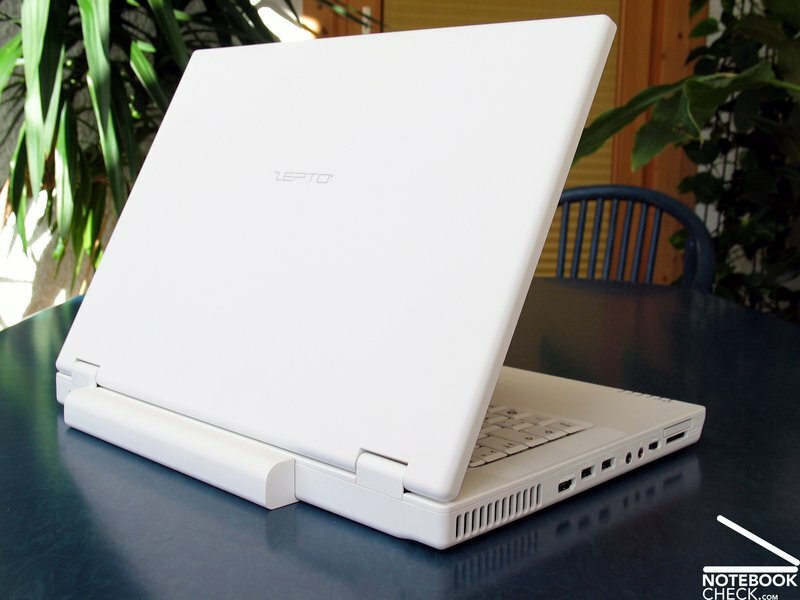 The Zepto Mythos A15 is about 40% faster than similar notebooks with 8600M GT graphics card. 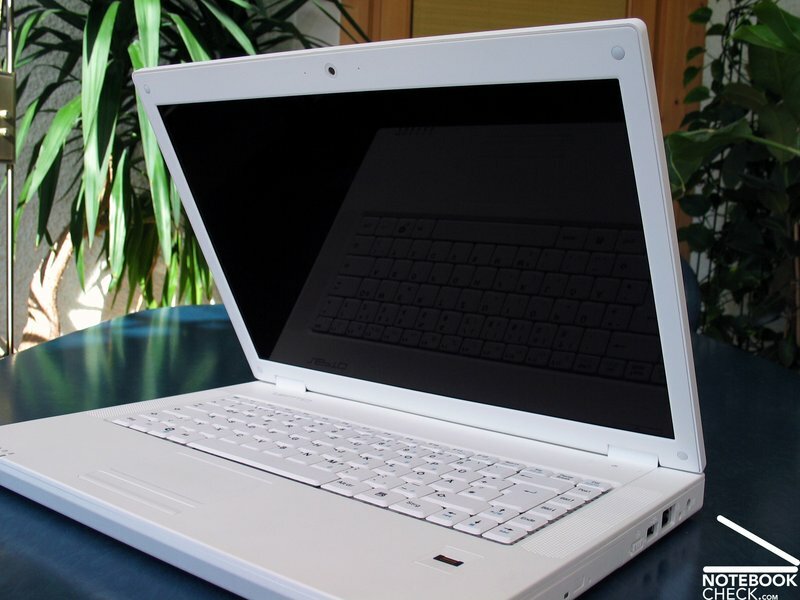 However, the Mythos is significantly behind the Acer 5930G with the same graphics card, even though the Acer has a weaker CPU. The Zepto Mythos A15 achieves a better result in the PC Mark 2005 benchmark test with 6350 points, and positions itself in front of similar notebooks. The Zepto was also convincing during the Cinebench R10 benchmark test, especially in the Open GL shading test and in the single and multi GPU test. It was even faster than the powerful Area-51 m15x with Intel Extreme x9000 CPU. OpenGL performance was good as well. The test sample managed to defeat the Acer Aspire 5930G in this discipline. Since both notebooks use the same graphics card, it is most likely that different drivers made the difference. 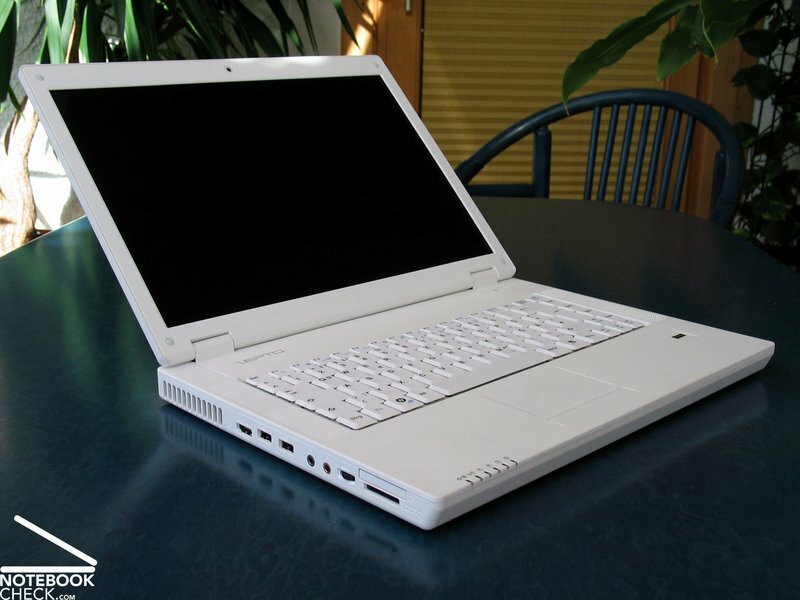 Due to the Intel Montevina platform it is possible to equip the Mythos A15 with up to 8 gigabyte of RAM. 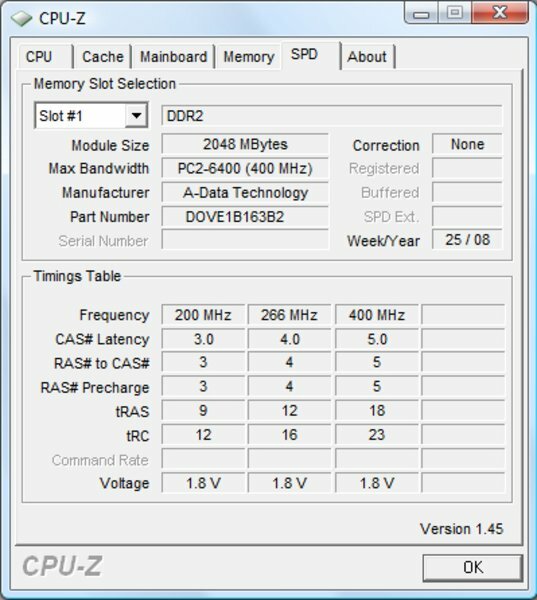 DDR3 memory can be used too, but currently it is too expensive and rare to be a viable alternative. Therefore Zepto currently offers only DDR2 RAM. 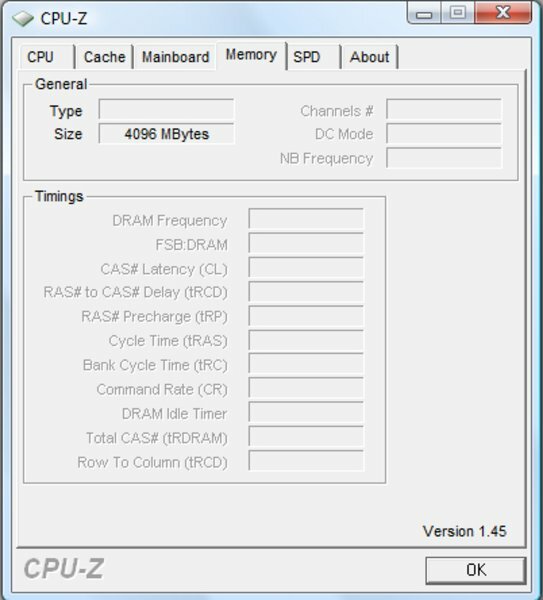 Our test sample contained 4096MB DDR2 RAM with a speed of 800MHz (PC2-6400) and Windows Vista Home Premium 64-Bit is installed to make use of the entire available RAM. 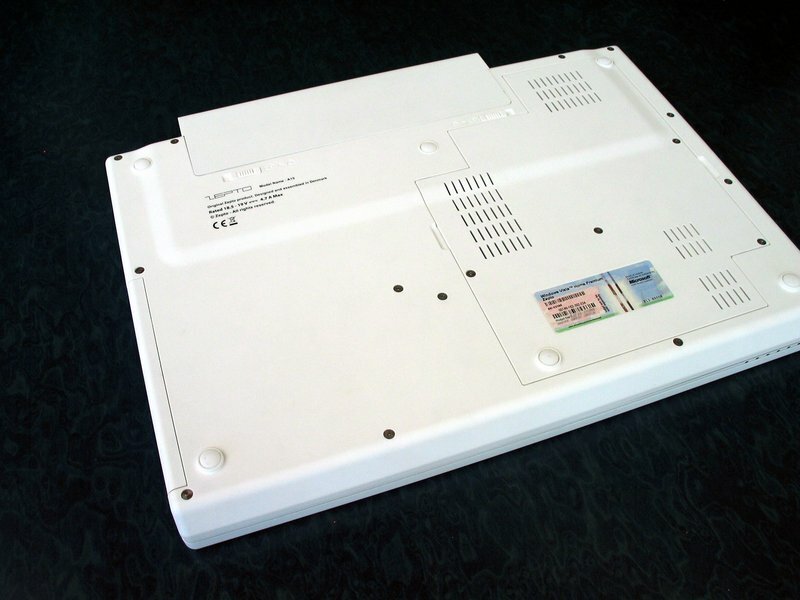 Our test sample contained a hard disk made by Toshiba (MK3252GSX), with a capacity of 320 gigabyte. 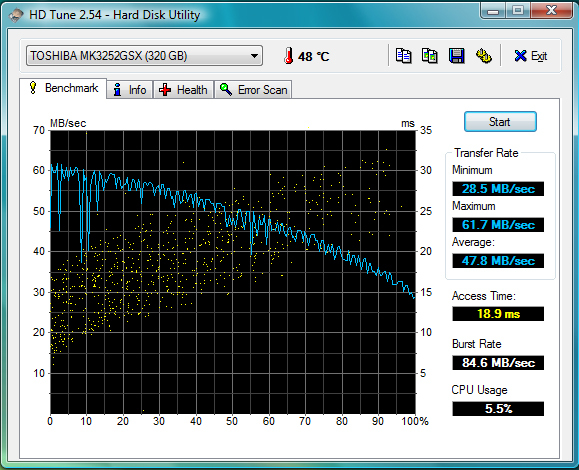 Access times and transfer rates of this mass storage were only average in the HDTune benchmark test. Zepto also offers faster hard disks with 7200r/min and a capacity of 320GB, or even solid state drives with up to 128GB, if the buyer is willing to pay 488 Euro more. Considering the hardware, it is obvious that the Zepto Mythos A15 is at least partially targeting gamers. Especially the Geforce 9600/9650M GT graphics card delivers enough power to play current games with satisfying eye-candy. 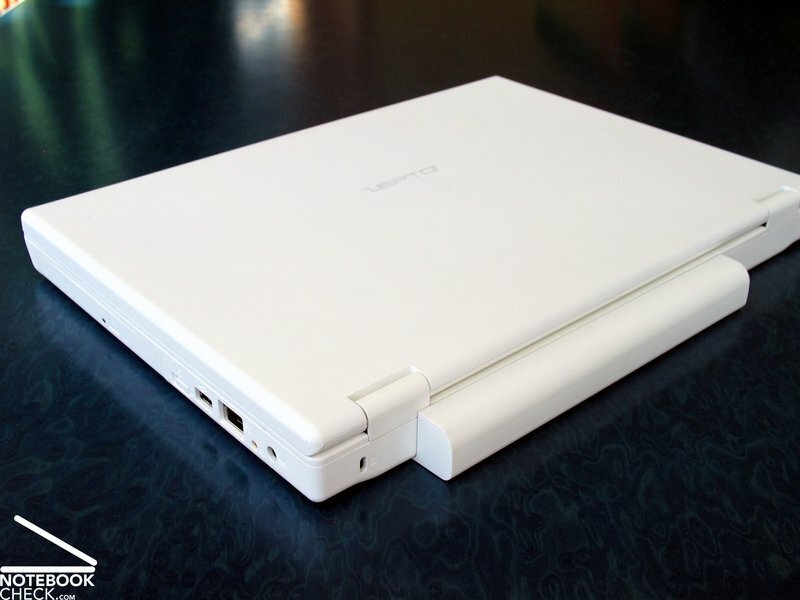 The first candidate to test the gaming capabilities of the notebook was Crysis. The Zepto Mythos A15 achieved a performance of 23.6 and 23.1 frames per second in the GPU and CPU benchmark tests with medium details (1024x768). While playing the first single player mission, the frame rate was between 15 and 33 fps. The game was playable, but not really smooth due to frequent frame drops. The fast shooter Unreal Tournament 3 ran very well on the Mythos A15. Fraps logged a frame rate of 58-62 fps with a resolution of 1024x768 and standard details (level 3/5). Increasing the resolution to 1280x800 pixels lowered the result to still well playable 45-63 fps. However, switching to the maximum resolution of 1650x1050 pixels slowed the game to rather choppy 32-48 fps. The first mission of the popular multiplayer shooter Call of Duty 4 – Modern Warfare ran with 40-70 fps (1024x768, all options on or medium, AA deactivated), which felt smooth. The demo of the racing game GRID Racer was also well playable while driving the BMW M3 for the German team. With a resolution of 1024x768 and deactivated XMSAA, it ran with smooth 33-45 frames per second. Finally, the Mythos A15 had no problems with EA's new simulation SPORE. We fought and socialized without any issues until the tribal phase. Even with the maximum resolution of 1680x1050 and all details on high, it still managed well playable 25-30 fps. The fan starts to run the moment the notebook power button is pressed. This alone is not such a problem, since the 34.6dB(A) loud noise is still acceptable and keeps in the background. However, after a running for a while or after the notebook is put under load, the Mythos fan becomes really annoying. Depending on temperature or performance demands, it frequently (every 2, 3, 4…-10 minutes) spins for a short time at maximum speed, just to slow down to the normal level after a few seconds. Worst of all, the noise level of the Zepto A15 goes up to 45.4dB(A) while the fan spins so fast, which is already quite loud. Additionally, there is also the problem of the large contrast between the modest noise in idle mode and the sudden whining when the fan spins up. Under load, especially while gaming, the fan of the Zepto Mythos A15 is constantly running at maximum speed. However, this is much less of a problem than the frequent spinning up of the fan in idle and office mode. According to Zepto, they are currently working on the problem. Hopefully a solution can be found soon. The reason for the high spinning fans under load becomes clear after observing the surface temperature. For example, the bottom side of the base unit warms up to 44.3 °Celsius on the central area and feels pretty hot. The upper surface warms up to 38 °C and 37.2 °C around the left corner. (±) The average temperature for the upper side under maximal load is 34.2 °C / 94 F, compared to the average of 30.9 °C / 88 F for the devices in the class Multimedia. (+) The maximum temperature on the upper side is 38 °C / 100 F, compared to the average of 36.5 °C / 98 F, ranging from 21.1 to 71 °C for the class Multimedia. (-) The average temperature of the palmrest area of similar devices was 29.1 °C / 84.4 F (-8.1 °C / -14.6 F). The sound quality of the integrated speakers is a bit disappointing. They produced weak sound without bass in the test, which failed to impress during music playback as well as games. Not only the sound quality, but also the maximum volume was rather bad in the test. Especially DVD playback was too quiet. There is no point having the best image quality thanks to the Blu-Ray drive, if the sound completely fails to immerse the viewer. There are two ways to avoid this problem: Either to use a high quality headset or earphone, or to connects the Zepto A15 to an available Hi-Fi system, with guaranteed full digital transfer of the audio signals, due to the optical S/PDIF output. Zepto offers two different batteries for the Mythos A15. Either a 6-cell lithium ion battery or a larger 9-cell battery with a capacity of 79.9Wh. The latter costs about 30 Euro more, which is quite cheap. 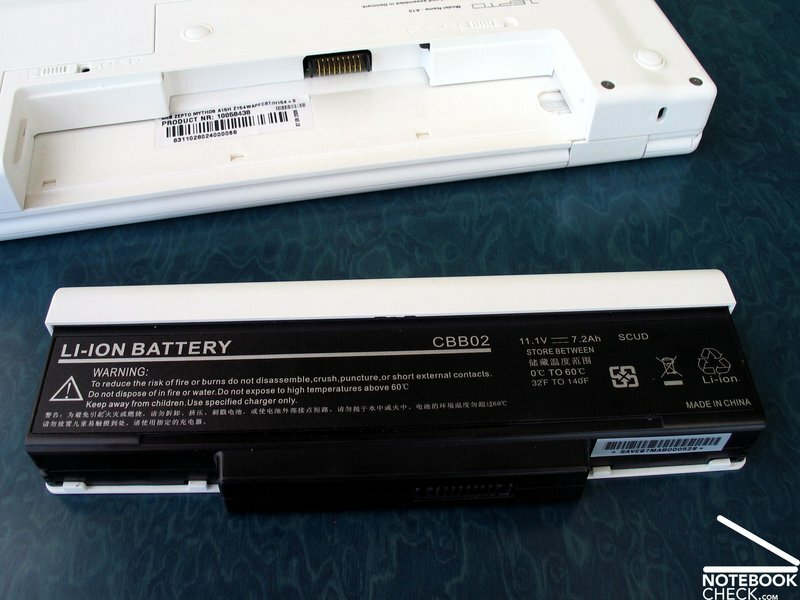 A disadvantage of the larger battery apart from the weight is the size of the battery pack, which stands two centimeter out of the back of the notebook. The 6-cell battery on the other hand, fits neatly into the case. Our Zepto Mythos test sample with the 9-cell battery achieved a maximum battery life of 223 minutes in the BatteryEater Readers test (minimum display brightness, energy saving mode, WLAN deactivated). 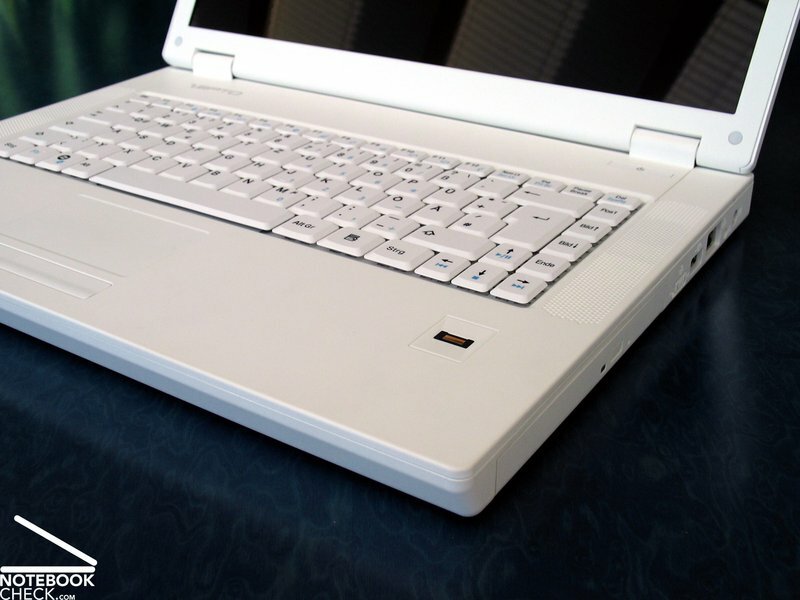 The BatteryEater Classic test simulated the worst case scenario, minimum battery life of the notebook under load. With maximum display brightness, energy mode high performance, and activated WLAN, the Mythos A15 depleted the battery within 142 minutes. 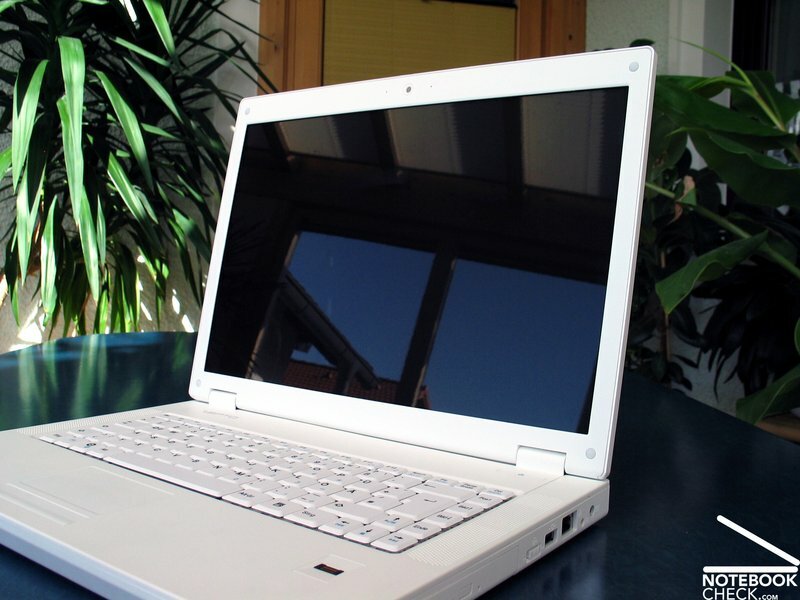 During practical battery life tests, for example while using WLAN with 90% display brightness and activated energy saving mode, it took about 190 minutes until the notebook turned off. This is not very impressive, considering the large 9-cell battery. But at least the Mythos managed 145 minutes DVD replay. Therefore watching an average Hollywood movie shouldn’t be a problem. This is not the case during Blu-Ray playback, since the decoding of the video data puts far more load on the hardware components. 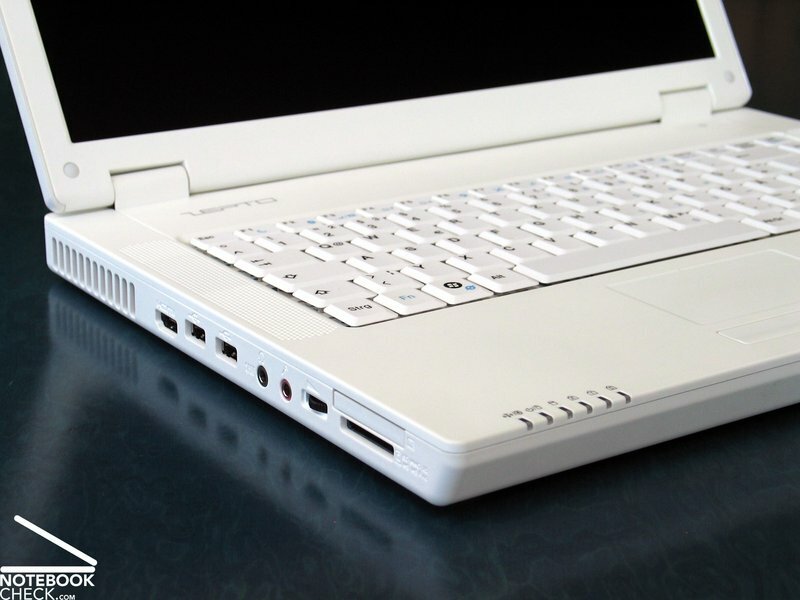 The Mythos A15 from the Danish producer Zepto uses its white design to impress visually and to stand out among the competitors in the powerful 15.4” multimedia notebook section. This strategy may succeed, but the design can’t compensate for weaknesses like the different clearance sizes around the battery and the display. The base unit is robust and flexural rigid, as opposed to the display. The rubber coated surface feels soft and silky. But not everyone likes it, so the decision is up to the users individual taste. The keyboard is well designed and fits nicely into the overall appearance. All keys are properly located and don’t need any getting used to. But workmanship is once again a point for criticism, because the left side of the keyboard unit isn’t mounted properly into the case, which can cause a rattling noise while typing. The WSXGA display in our test sample made a positive impression, with its good brightness and a very good contrast ratio. Unfortunately, the glossy surface prevents it from being used outdoors. An Intel P9500 CPU and an nVIDIA Geforce 9600M GT graphics card provide the Zepto Mythos with a lot of power for standard applications, demanding multimedia applications, and games. Even the Geforce 9600M GT graphics offers acceptable performance for current games, but it should be possible to increase performance further with the 9650M GT graphics card. The downside of the high performance hardware is the noise level. Even in idle mode the system fan frequently spins up. It’s easier to put up with the noise when the notebook is under load, because it stays on a constant level. The notebook also gets pretty hot at the bottom, but as long as it’s used stationary, this shouldn’t be an issue. Despite the largest available battery with 9 cells, the notebook only manages an average battery life. The hope for outstanding mobility is thus wishful thinking. 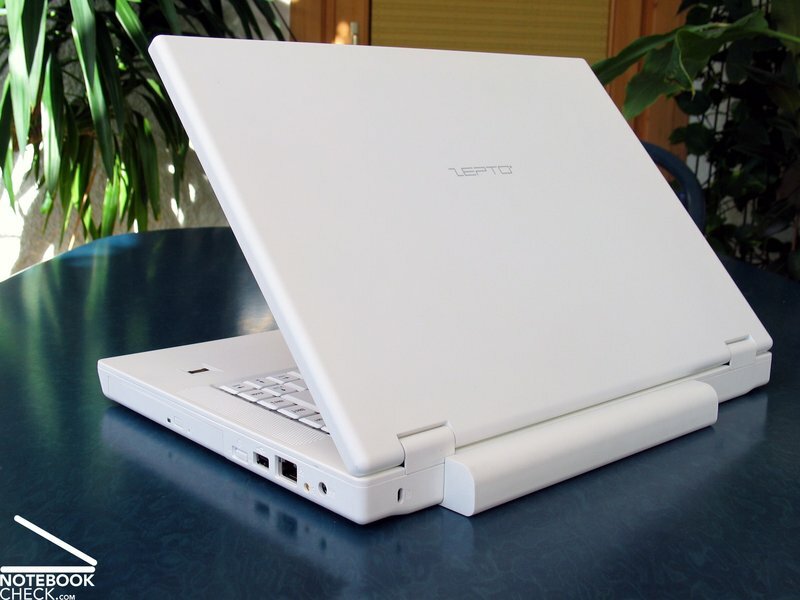 Zepto gave its new high performance multimedia notebooks a completely new outfit. 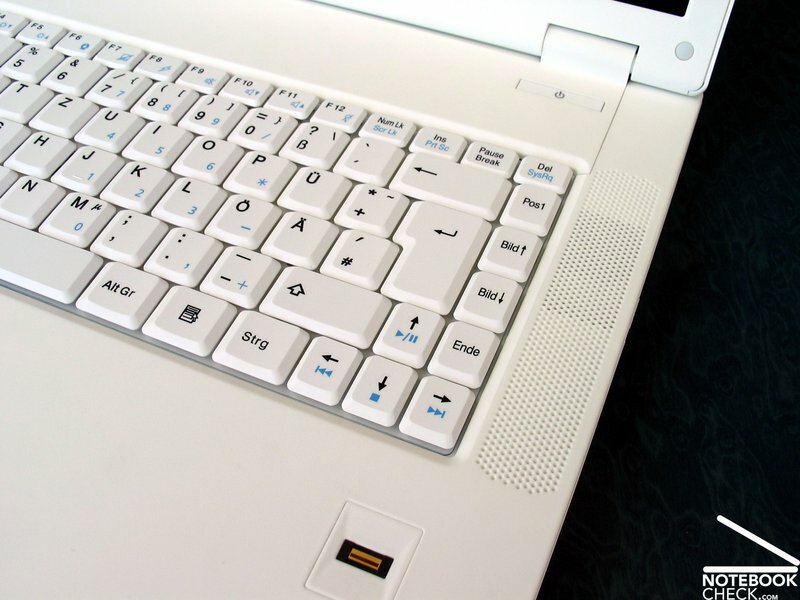 An exception is the area around the A-W-S-D keys, which can get noisy while typing. 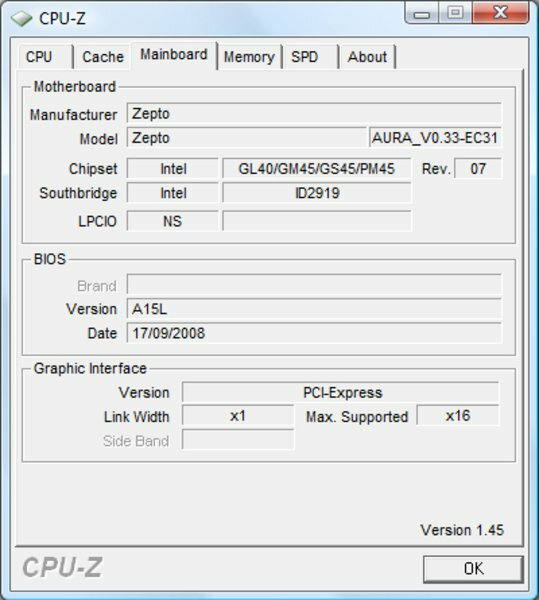 Zepto offers currently two different displays. 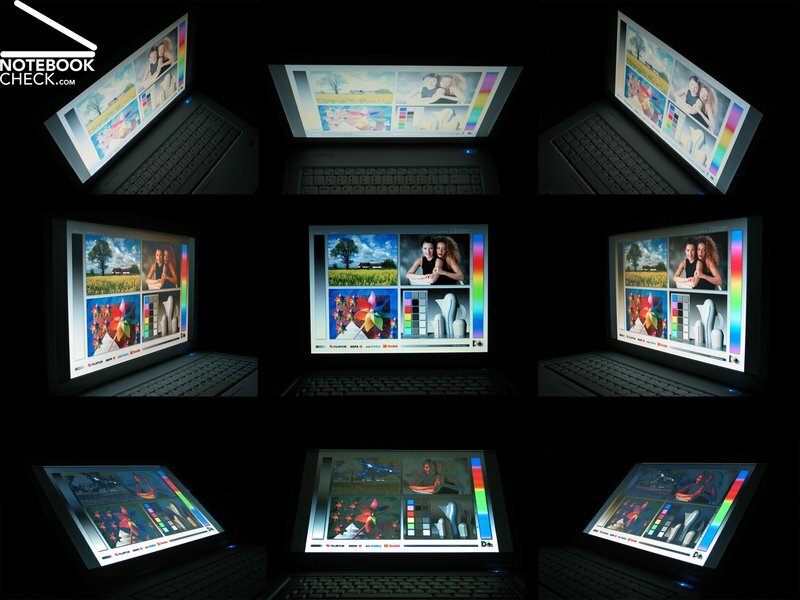 A standard WXGA display or a WSXGA display with a higher resolution of 1280x800 pixel. This display showed good brightness and a very good contrast ratio in the test. One of the strengths of the Zepto Mythos A15 is its powerful hardware. 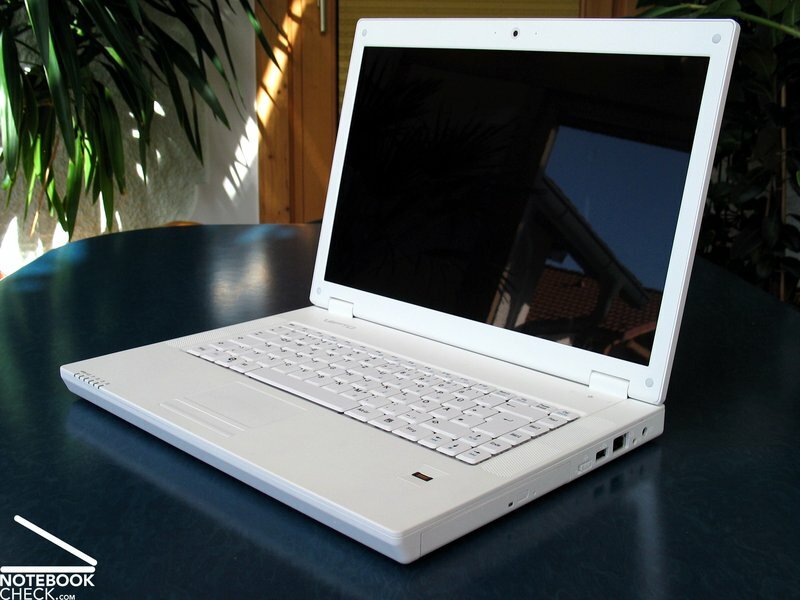 The notebook has ample performance due to a Centrino 2 processor and a nVIDIA graphics card (Geforce 9600M GT, 9650M GT). 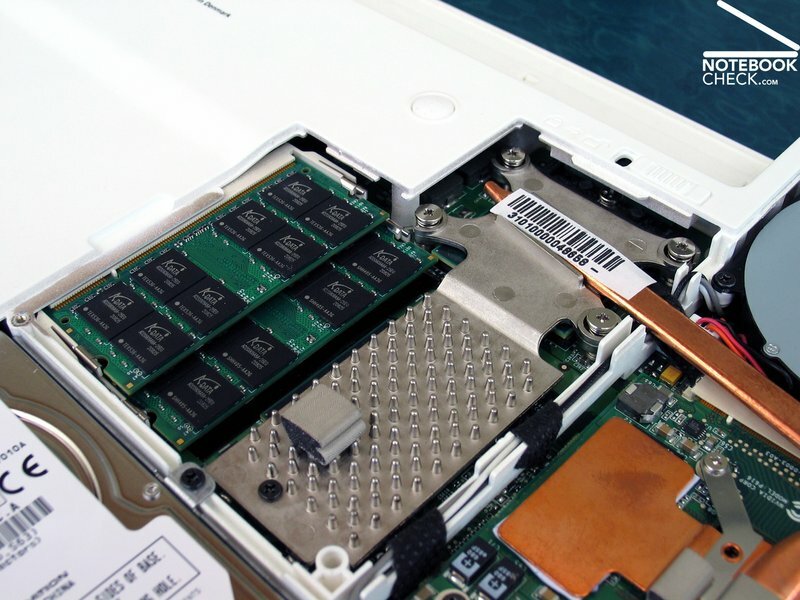 Thanks to the Intel Montevina platform it is possible to put up to 8GB DDR RAM into the Mythos A15. Unfortunately, the notebook doesen't seem to be able to handle the additional heat of so much RAM. Even in idle mode the fan occasionally spins at maximum speed for short periods of time, which is rather annoying. The surface temperatures can get pretty high, especially at the bottom of the case. The quality of the integrated speakers in the Mythos A15 is insufficient. The sound is unattractive, weak, and without bass. 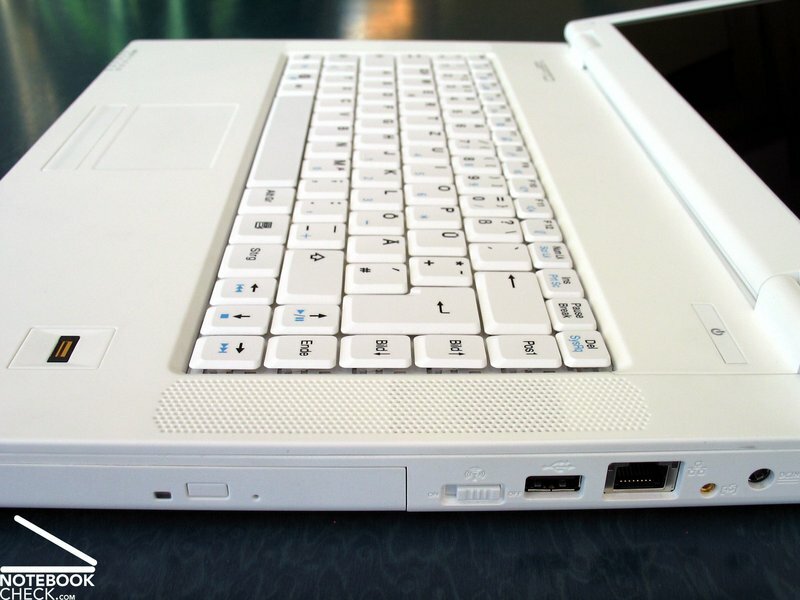 The keyboard fits well into the overall design of the Mythos A15 and offers good usability. 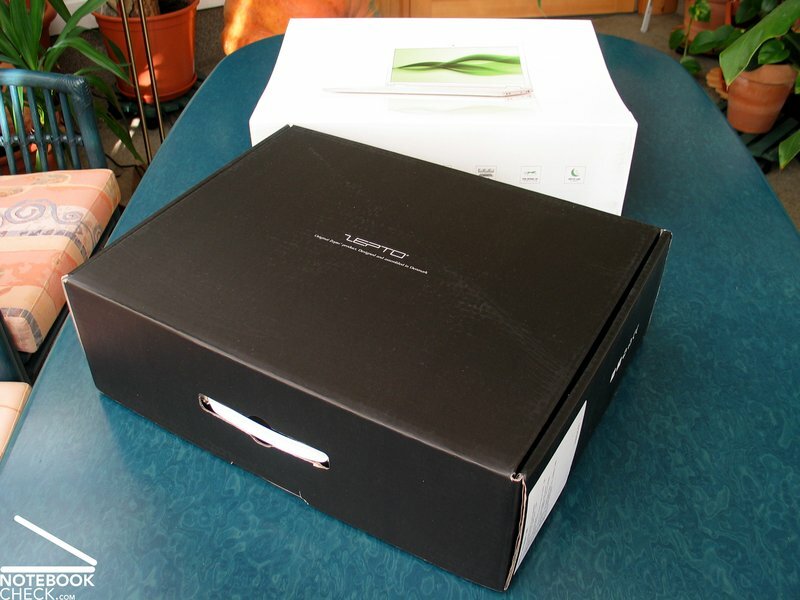 A finger print reader offers additional security. Apart from 3 USB 2.0 ports, it also offers a digital HDMI display port and an optical S/PDIF output. 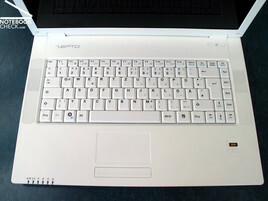 The Zepto Mythos A15 is entirely in white, which combined with the geometrical style resembles products made by Apple. The case has a simple shape, without any outstanding bells and whistles. The Zepto Mythos A15 is not only appealing to the eye, but also to the sense of touch. The entire surface of the case is covered with rubber, which feels like silk. We noticed a few weaknesses regarding workmanship. For example, the clearance near the battery and around the display is not uniform. Case stability on the other hand is satisfying. The display lid is more problematic and can't handle point pressure properly. ...and can't quite prevent the display from wobbling. The Zepto Mythos A15 offers various current interface options. Although the Mythos has a 9-cell battery, it only achieved an average battery life time, and is thus not exactly a mobility professional.